I have been building fine quality furniture and wood products since 1982. 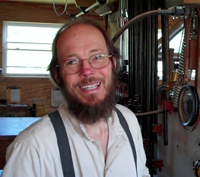 I have had an unusual journey, having been a part of the Amish and related Mennonite groups for most of my life. Their legendary ascetical worldviews had a profound influence on my work and manner of construction. Though never a part of a Shaker community, this past religious movement also had its effect and influence on my developing and continued work. Shaker founder Mother Anne Lee's pronouncement to "Build as though you were to live a thousand years, but as though you were to die tomorrow" fit well with my aspirations. 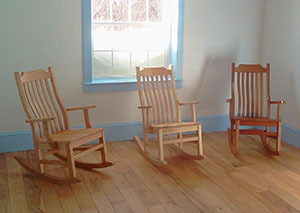 I wanted to build beautiful and enduring furniture that could be passed down to future generations. And with my "otherworldly" concept, desired to make it as simple and serviceable as possible. Thus the Shaker designs fit well into my paradigm, and as many can testify, have become timeless in their appeal. There are a few exceptions in the Colonial and Mission styles that blend in well with this concept and beauty as well, which I also incorporate into my work. I have also aspired to producing my furniture in the most sustainable manner that I can, and have for many years ran my shop entirely by hand or literal horsepower. In fact, with one of the Old Order Mennonite groups that I was a member of, this was the only permitted way. No electricity or gas engines were allowed. I continue to follow this concept in the use of my draft horses to power some of my tools, as well as the use of electricity for others. My goal is to slowly change from mostly mechanical horsepower (i.e. 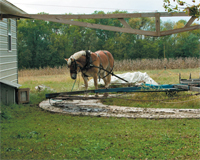 using gearing & lineshafts) to horse powered generators that can produce the more reliable power of electricity. Plans are to construct and install a horse treadmill for this purpose. I instead work almost exclusively in solid wood, building with inevitable wood movement in mind. Thus incorporated into the construction are sliding dovetails, floating tenons, etc. 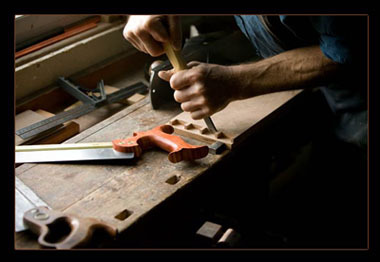 I make use of both hand and power tools to individually craft heirloom quality furniture for your home. Take your time to browse through the catalog to see my work and decide for yourself. I strive to offer high quality fine furniture at a reasonable price but I can't compete with furniture factories. Yet your investment into my work will be far more rewarding and enduring as the years roll on. Thank you for your interest in my work, and I hope you will find something useful to cherish for years to come!